We don't have any trips to Turkey at the moment . It is impossible to visit Turkey and not be seduced by the wide variety of items displayed in the markets, bazaars and shopping centres. The most sought after are the traditional carpets and rugs since in addition to being very cheap they are of very good quality. Turkish lamps are also very popular; the hallmark of the country and characterized by their cheerful colour. Turkey is also a good place to buy imitation clothing and accessories in leather, cotton or silk. The most frequented places to make this type of purchases are the Grand Bazaar, one of the essential stops in Istanbul; or the Mahmutpaşa Bazaar, smaller but it still has a great variety. The area of the modern Taskim has become trendy in recent years. This is where the big firms are, as well as narrow alleys full of antique stores. Among the shopping centres there are Demirören Istiklal and Cevahir, full of shops for all tastes. On the other hand, in the Anatolian region the craft shops are unmissable. The best pottery is found in Avanos, while in Göreme you can find great relics and the most typical items of the country including the famous blue lucky eyes. 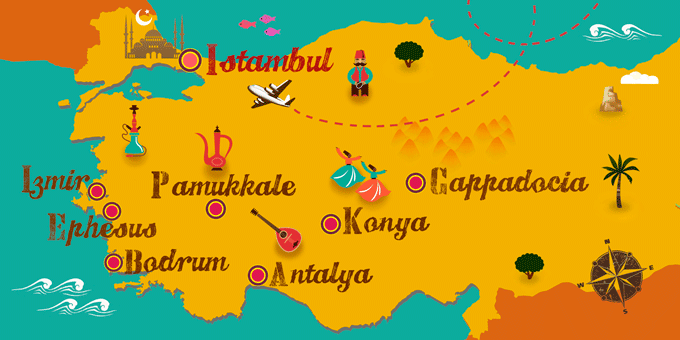 If Turkey has caught your attention, leave us your number so we can call you to discuss the voyage that awaits you.